This started as a pictorial feature with a bit of DIY details. But as I started talking with friends about the article, it was clear that giving some basic entertaining pointers would be what people need most. Any gathering, holiday or not, does of course take some effort. Delicious meals with good company do not just magically happen. You must create them and this is not easy-peasy pumpkin pie. Note that the title of this is not ‘Easy Perfect Holiday Meals!’ Yet it doesn’t, and shouldn’t, need to be insane work or tons of stress either (yes, Lisa, my all-nighter Thanksgiving party friend, I’m talkin’ to you!). Entertaining Rule #1: Don’t sweat the small stuff. Before you start to plan your dinner party, remember that the little flaws that you see and your critiques are either lost on people entirely, or the fact that you are gracious enough to open your house up far outweighs (and thus makes them forget about) any flaws. The chicken being dry, or the pie crust being so hard it could double as a frisbee will not be what people remember. Laughter, kindness, a general impression of the evening’s style and fun is what they’ll leave with—and a feeling of gratitude towards you for being the hostess! Entertaining Rule #2: Be welcoming and gracious. Being relaxed and able to connect with your guests is so important! That’s what the season is all about…not a house decked out head to toe in red and green tartan or an elaborate whole house color schemes in the au courant color. Perhaps one of the biggest – if not THE biggest – factors in a successful gathering is the hostess and host’s warm, welcoming, and relaxed demeanor. Take a deep breath and smile when the door bell rings! You setting the tone and greeting each guest is far more important than everything being perfect! And when things go a bit off course or accidents happen, be gracious and move on with as much finesse as you can muster. Wine gets spilled, people are late, kids break things so buy some Folex cleaner and get the dust broom out when needed—just do it with a smile. Entertaining Rule #3: Keep things balanced and true to yourself. Entertaining is a bit like decorating. The most successful people use the high and low mix theory, but in this case, I’m referring to a mix of challenging and easy. When you plan a party, you need to focus on what you like to do! If you love a glamorous, more formal table, go for it! And if you instead fall into the opposite camp, this advice holds true as well: have a minimal, sleek and elegant table and focus on other things like food and music. Or skip both those and have a very casual buffet set up, or perhaps a fun and whimsical look. Just do what feels good to you and balance the rest of the party accordingly! Balanced means not taking too much on or straying from your own style. So, if you are going all out in one way (like food) then you should keep things very straightforward in other ways. 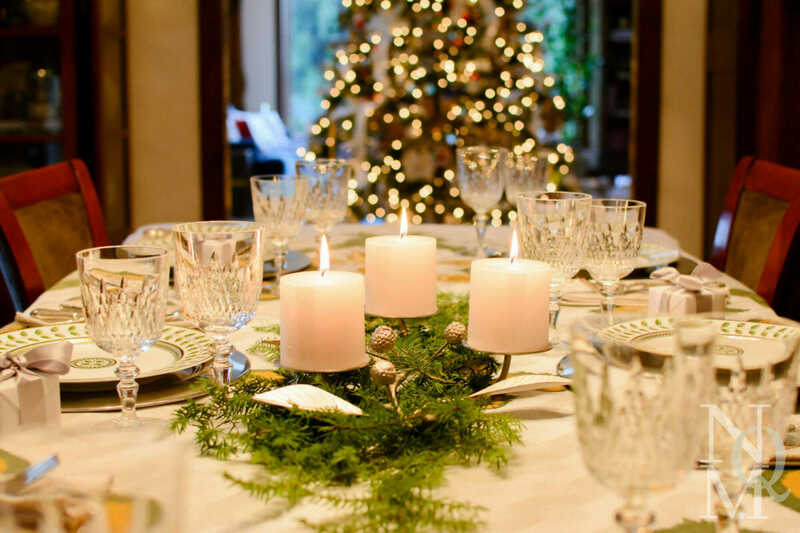 For example, if your menu is very labor intense and time consuming, then go for a simple linen table cloth that doesn’t need pressing (see the pink tablescape on the right) and some dried flowers strewn along the table with votives, or opt for just a few candles or a very simple centerpiece that you order from your favorite florist. And set the table 1–2 days beforehand so there’s literally not a moment of stress or work as you’re working hard in the kitchen. On the flip side, if you adore a lavish, stunning table setting complete with place cards and chargers, it’s wise to serve simple yet delicious food that can be prepped almost entirely ahead of time and not consume hours and hours of your time. Because your table will take a good deal of effort, cut corners in other ways like buying dessert perhaps or getting a course or two from the take-out gourmet shop. I say all this from a place of experience and am hoping you don’t repeat my *ahem* growth opportunities! I have had many a party where I ended up a major stress case because of timing issues. I’ve thrown parties that just didn’t quite feel good because I felt like I should purposely simplify the decorations or food in an effort to force being “casual,” when that’s frankly not my style. I love the details and if given free reign, I’ll work on making the table or party particularly beautiful. It’s my jam and I love it. I’m not doing to it impress the Joneses’—I’m doing it to make myself happy. I’m just not a paper plates, plastic cups gal unless it’s a big party or BBQ. My balance is that I ask for help from my family: my daughter helps with food prep and husband with any bar prep. Or we serve take-out food, mix Trader Joe’s mashed potatoes with my roast beef, or serve simple roast chicken and vegetables. As long as it’s fresh and tasty, that’s all that counts! The bottom line here is that you should lean into what your good at and figure out ways to keep the other parts of a party S-I-M-P-L-E. Entertaining Rule #4: Always—and I mean ALWAYS—have a Welcome Tray out before guests arrive. What, pray tell, is a Welcome Tray? It’s just a simple snack or two and 2–3 ready-to-serve beverage options. So, this means you set out glasses to suit your offered drinks, small plates or cocktail napkins, any serving tongs/utensils needed, or other general items like wine openers so that guests won’t need a thing to enjoy your offering. This should all be self-serve, although it’s best if you, your husband or a designated friend can be there to encourage folks to dig in or serve their drinks. My go-to welcome tray is a bottle of Pellegrino, a bottle of prosecco opened (but with a stopper in it) in a bucket and on ice, one small pitcher full of pre-mixed cocktail alongside an ice bucket with tongs and cocktail shaker if needed. Food favs are marcona almonds, olives, and a salty snack like Chex Mix or Trader Joes Classic Potato Chips (which have plastic wrap on them until the doorbell rings). This entire set up takes a matter of minutes to put together and will result in relaxed, happy guests right out of the gate. More importantly though is it takes the pressure and stress off you! If you have anything last minute to chop or pop in the oven, there’s no concern because the guests have their needs met! It basically buys you lots of time. Entertaining Rule #5: Timing matters! You need to be seated and have your fork lifted before your guests will relax which means that well before the day, you should chart out your timeline and time block your work for the whole day. And do as much as possible days ahead of time. Be sure to include time for you to change and get ready, and time to do a quick clean if needed (see 5 Easy Steps to Get Your Home Guest Ready in 30 Minutes). This timeline doesn’t need to be nutty, down to the minute stuff, and shouldn’t take a lot of time to write. I usually note the time to start and basic details like oven temp and cooking time plus who’s making it. Obviously, things happen and it’s likely to go off the rails a bit but as long as you know your hard time boundaries like when food has to go into the oven, you’ll feel a lot less stressed and will allow you to omit things as needed. Plenty of successful dinner parties that I’ve thrown have one less appetizer than I’d planned or candles instead of floral arrangements. No one knew and no one cared! Entertaining Rule #6: Gladly Accept and Request Help. If a guest asks if they can help, take them up on their offer! Make a list for your husband and kids of tasks you’d like them to do. Even little kids can help set tables and get ingredients out of the pantry. If your family is like mine, prioritizing the tasks and putting to be finished times on the task list is very appreciated. Entertaining Rule #7: As the doorbell rings, pause, take a breath, smile, and remember Rules #1 and 2!